It has been very VERY busy around here lately. Which is the reason for my lack of posts! Our landlord notified us out of the blue that our home was being sold, so it’s been a mad panic to find a new home, pack, clean, move, clean, tidy, sort, donate etc. We finally found somewhere, that is smaller and more expensive (joy) but there was limited rental properties on the market, so we took it. We moved in earlier this week, and there is light at the end of the tunnel! Hopefully by Sunday, we can put some of our stuff into storage (no room at the inn!) and on Monday the two wardrobes are being collected by charity and then on Tuesday evening the table and chairs are being collected and relocated to a new home! We currently look like a cross between student lodgings and an episode of hoarders! By next Wednesday, we should have more space! And a sofa! My body for a sofa! How I miss just being able to sit on the sofa and watch TV. And Internet. Our internet is being connected today! Ive used almost 2GB of data since Monday!!!! Anyhoos, I’ve got lots of stuff lined up. Hopefully in the next week or two, once I’m sorted and have some sort of a home environment, I can continue! As Emma currently says (this kid is a riot!) See You Next Time! BYE! Author beccaPosted on July 23, 2015 July 23, 2015 Categories LifeTags charity, life, moving, parenting a toddler, TIREDNESSLeave a comment on All Change! After my initial assessment with CAMHRS, I came away feeling defeated. The GP in training who saw me, seemed disinterested, talked over me, pressed issues that I felt were not relevant, and her report was contradictory and had gaping holes. I read my report and promptly cried and then shoved it away, never to look at it again. My symptoms have gotten worse. 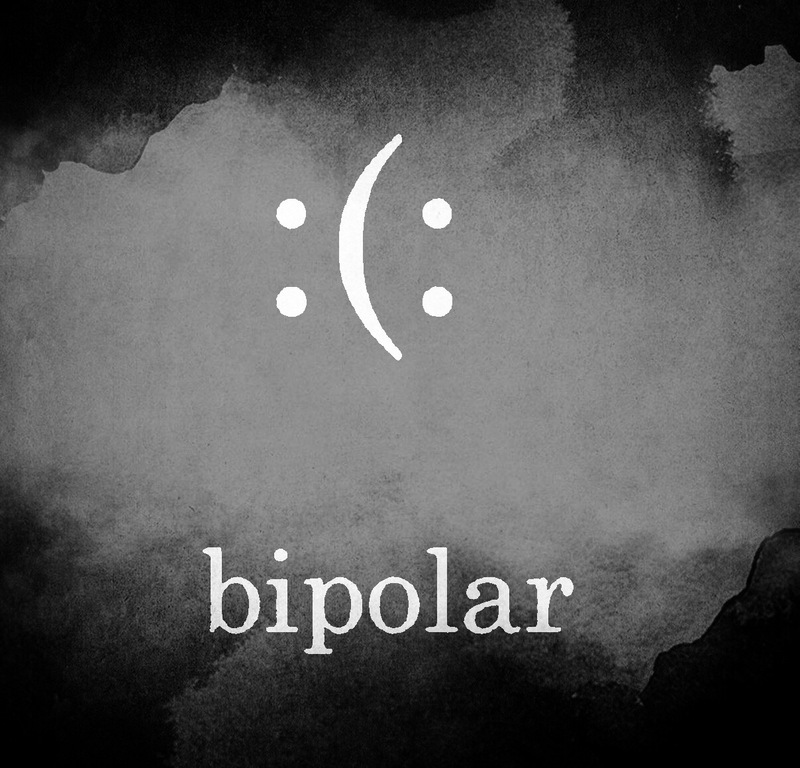 My moods cycle too quickly between high and low, and don’t seem to stabilise for very long. Small things that I’ve previously shrugged off, have slotted into place. Particularly an incident that happened just after Emma’s birth. Some days it’s like I’m not in my own body. I’m stood outside watching my life and I recognise that my behaviours are abnormal. I dug out my letter from CAMHRS and uncrumpled it and pushed myself to go back to the doctor. I like my doctor, she’s very matter of fact, and to the point. No nonsense. She immediately referred me back to CAMHRS with a request for a psychiatric clinician to do another assessment. It’s so incredibly hard to verbalise sometimes. I find I’m much more open to discuss my symptoms when I’m experiencing a manic episode. When I’m in a depressive episode I’m more inclined to withdraw and internally sift through everything, which just makes it worse. I’m fed up of this. In November 2012, whilst pregnant with Emma (Flump at the time) I got a call from my aunt saying that my grandfather had been admitted to hospital. They thought he was having a stroke. I left work, went straight to the hospital and straight into resus, to find my grandmother very distressed and my grandfather in a pretty bad way. He was admitted that evening. For a week I travelled to and from my home in Feltham to the hospital in Woolwich, via my job in London. 6 months pregnant, it was exhausting and stressful and distressing. Eventually my doctor signed me off and demanded I rest. You see, my grandfather had been diagnosed with prostate cancer a fair number of years beforehand. He delayed treatment (for reasons that still make me seethe in anger, silly gold digging fake wife) and it spread to his bones; a further diagnosis of secondary bone cancer. He started treatment, and it was all going well. Then it wasn’t. Then the hospital admission. Scans showed that he hadn’t had a stroke, but the Cancer had spread into his skull and was putting pressure on to his brain, which is why his symptoms were similar to a stroke. His liver was enlarged and the doctors couldn’t do anything else. They made him as comfortable as they could. There was talk of a hospice, however, they then decided that it wasn’t the best option. Just after midday on November 25th 2012, my grandfather passed away. 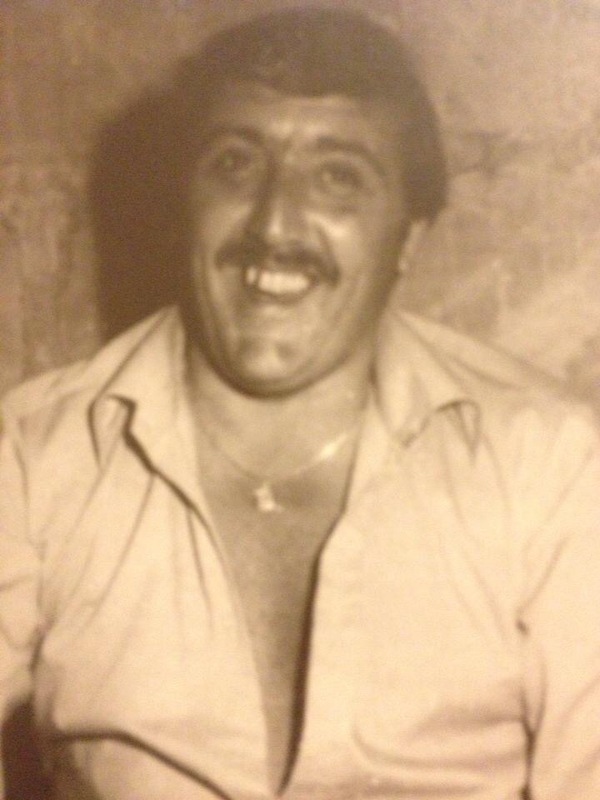 In the few days before he died, I sat at the hospital with him, with my aunt, cousins, siblings, grandmother and his carer. I only ever left to get sleep, shower and food. I don’t think my grandfather was impressed. Within a few minutes later his breathing changed. His blood pressure dropped, his heart rate slowed. The nurse checked him over and asked if we needed the priest called. The priest came, gave my grandfather his last rites, and prayed for him. I sat next to him as he took his final breath. He was surrounded by family. That was the first time Id ever sat with someone as they died. I was sad. I was upset. I was angry. Raging in fact. Cancer. Hideous disease. 2 years later (practically) I found myself in the same situation. Treatment started, it was going well. Then it wasn’t. They moved on to the next treatment. I lost count of how many treatments she had. They moved to experimental treatments and she joked that she was probably worth a lot of money now, due to the amount of platinum (I think?) that was probably in her body. We discovered we were having a baby, and there was talk of stem cell treatment. Id recently lost my grand father. I looked into cord banking, but only a few hospitals do it. I offered up mine/Flumps cord stem cells. I lost count of how many times she was in hospital, how many times we wanted to visit but it wasn’t a good idea as she was in isolation due to being immunocompromised. Sadly nothing worked, and each set of treatment failed. She was due to celebrate her 30th birthday. However she was in hospital. So we went to visit her. My mum looked after Emma. Daniel met me in London. We got burritos for lunch. Then jumped on the Tube to the hospital. She was in the ICU, on a ventilator. She’d been moved into a private room since we’d last saw her. It was her birthday. There were party hats and cards on the wall. There were a lot of machines. About 4pm, the doctors wanted to speak to her mother and husband. We were about to leave, but as they came out her mother was very distressed. There wasn’t anything else they could do. Immediately I was transported back in time, 2 years previously. My husband and I set about to call friends. Handholding, fetching drinks. Visiting numbers to the room were relaxed, as were visiting hours. Her dad arrived. He drove from the North, getting there in 4 hours. In laws arrived, driving 2 hours from the South. We talked to her, held her hand, joked with her and each other. Her vitals improved when people spoke to her, when they touched her. She occasionally opened her eyes. She knew we were there. We said our goodbyes, and on her 30th birthday she passed away. From Cancer. I remembered how much I despised this disease. My friend was now a widower. At 30. It was unfair. They’d been married less than a year. I think about her and my grandfather every day. Every. Single. Day. They are why I’m doing Race For Life this year. If I can raise just a small amount of money which will go towards Cancer research, so that, hopefully, one day, this awful disease will be treatable, and people won’t lose their loved ones to it, then why not. Why the hell not. I’ll admit it’s not something I was going to do, but then they got in touch with me as a blogger and I wasn’t sure still. I definitely wasn’t running it. I don’t DO running. But I can walk it. 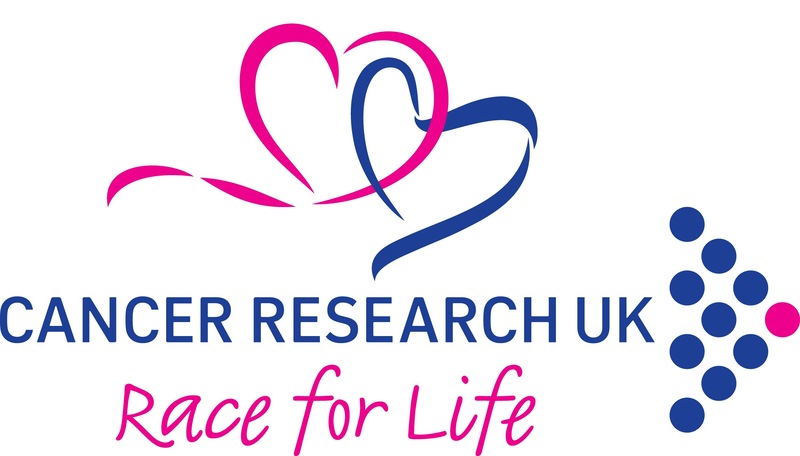 So this summer, I’m doing the Race For Life. With Emma. A 5k walk. We will be wearing matching tutus, that I’m going to make using the colours of the Cancer awareness ribbons for the types of Cancer that my grandfather and friend had. So over the next few months, I’ll be sharing more information about Race for Life, as well as tutorials for making the tutus, and posting the details for my fundraising page. Plus there will be other stuff, offers for those wanting to take part and I’ll be sharing on my Facebook page and Twitter account. Thank you Race for Life for asking me to work with you. I’m looking forward to it. Ive been lacking it of late, which considering recent events isn’t surprising. I’m still coming up with ideas on how to do that. I want to get fitter. I want to clear my debts. I want to start writing again. There’s a lot I want to do. As for writing, I need a muse. I may have to kidnap one. Anyone know where they hang out? I am no closer to an official diagnosis. Instead I am stuck in a limbo between the GP (who is pushing for a diagnosis) and an under-funded and under-resourced Mental Health trust who keeps pushing me back to the GP as my issue is not “severe” enough. But, I expect it’s going to take a LONG time. My options are to ride it out and continue to be frustrated and annoyed by a broken system and manage as best as I can, or look at going private. I have become disillusioned with the system. Up until recently, I had nothing but great experiences. Helpful, quick, supportive and practical help. Now? Not so much. I have a fantastic GP team, not as amazing as my previous GP team, but still pretty fantastic. But the rest, not so much. I’ll get there, but apparently I have to take the full boring long winded route. P.s I apologise in advance for upcoming posts where I ramble and use you all as my therapy sofa. It could be amusing and odd for you AND me. My working day is between 6am and 1pm. Which means I have to be up at 3:30am to get ready for work, leave at 4:30am to get the 5am train. Then 7 hours of work, to get home by 2:30pm so The Husband can go to work. Then spend 2:30 until 8pm being Mama and sorting Emma, getting her ready for bed, sorting my dinner and lunch for the next day. Hoping she goes to sleep without any problems, and then trying to sleep myself so that I get enough sleep before getting up again at 3.30am. Thankfully my employer has agreed a trial basis of this shift on a Monday to Friday basis. Which means I get my weekends free. Weekends to hopefully do the weekly shop, catch up on laundry, be a mama and the odd day out not to mention to relax and recharge my batteries. Of course this will mean it becoming a lot trickier to fit in social engagements and what not. Especially as The Husband is likely to be working more weekends than not. Ill also be more likely to want to chill at home and spend time with my daughter than do anything else too. 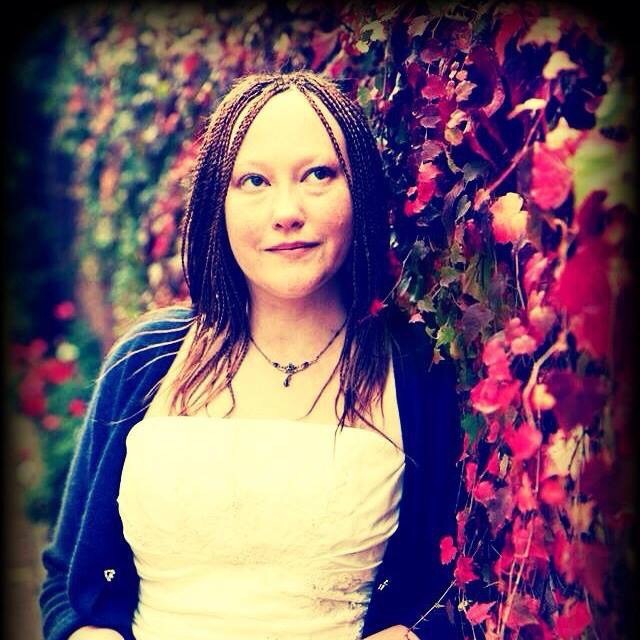 So, if you want to see Emma, you may need to book in advance to avoid disappointment. It’s like my daughters a restaurant! Never thought i’d say that. bubble bubble, toil and pentagram. It’s been a while since I posted something that is not baby/pregnancy related, and yesterday I was sat on the train home, after a particularly long and hard day at work and I happen to glance down at my left wrist. 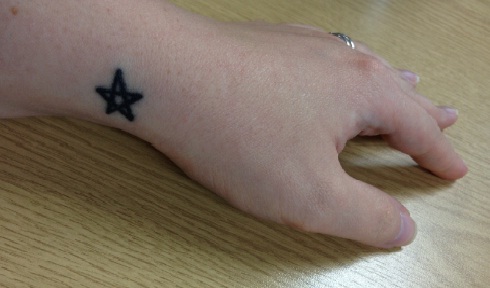 On my left wrist, sits my pentagram tattoo which I got in March this year, by complete accident. You see, I’d decided I wanted to get another tattoo for my birthday, so I found a design I liked, it was rather simple and bold. It was Thors hammer, or rather the rune Thurisaz. I’m not going to go into an explanation as to what it signifies or means, because that’s not the point of this post. My point is that I got my rune tattoo, on my back and as my tattooist finished wrapping my gift, I said to him, “would you do a pentagram on my wrist, do we have time?” We did, and he did, and now sat on my left wrist is a small pentagram, one of the symbols of my faith. I don’t know why, yesterday, I had a profound feeling after looking down at my wrist, but I did. It reminded me about the Wheel of the Year, and how quickly time flies and that the world is always changing, that I’m always changing, that life is always changing. I’ve never experienced that before and I imagine it’d be what some Christians feel when they look an image of Jesus on the crucifix, or what Muslims feel when the Imam calls out to signify that it’s time to say prayers. I’ve never been good at religion, so I can’t think of any apt analogies for any other religious followings. I don’t make it any secret about my beliefs, I am what I am, I believe what I believe and that’s just how it is. I tried Christianity and Islam, and it wasn’t for me. I stumbled across Wicca at the ripe old age of 15 and it stuck. I was more at ease with it, and more comfortable that I’ve ever been. Don’t get me wrong, there is nothing wrong with Christianity and its many branches, or Islam, Judaism and any of the other religions out there; they just don’t fit in with me. Wicca did, I can’t pinpoint what it is, but it’s something that makes me feel comfortable. I am not an initiated witch; I do not have a coven nor am I a member of a coven. I simply practice, like many others, on my own. The five vertices of the pentagram represent the four elements (air, earth, fire and water) with the addition of Spirit as the uppermost point. It’s a symbol that reminds me of who I am and the Wiccan Rede. Author beccaPosted on October 18, 2012 Categories Life, WiccaTags life, pentagrams, religion, WiccaLeave a comment on bubble bubble, toil and pentagram. Are Fridays the new Mondays? It’s Friday. My weekend starts in 7 hours. I’d be pleased if Friday wasn’t being such a jerkoff today. It’s really not my day so far. Firstly after getting ready for work, I thought I’d be clever and spray the bath/shower with the cleaning spray and rinse it off before I went. The plan being to clean the bathroom tomorrow and therefore the major task already having been pre-cleaned. The smell of the spray caused me to throw up all over myself and the pre-cleaned bath. Causing me to have another shower and run 15 minutes behind schedule. Then the train I was supposed to get? I missed it by 20 seconds. The next train would have got me to work dead on time. It disappeared from all the screens. After it was scheduled to leave, an announcement was made to advise that it was delayed. I made the decision to get the slower train, which would have made me 20 minutes late. The screens advised it was 8 carriages. So I stood at the 8 carriage mark, to save myself some time at the other end. It wasn’t. It was only 4 carriages. So I was at the wrong end of the platform with not enough time to get the train. My original, now delayed train had arrived and the doors stopped right in front of me, but instead of allowing me to board the train, 2 nice gentleman decided to shove me out of the way so they could get on first. Now I’m finally on my way to work, albeit it a bit squished. What have you got next for me Friday? Author beccaPosted on September 21, 2012 Categories LifeTags Bad luck, fails, lifeLeave a comment on Are Fridays the new Mondays?